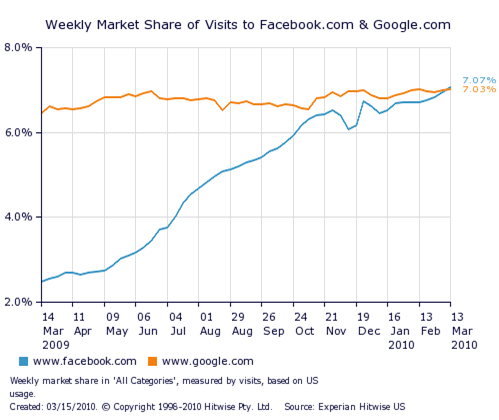 Event predicted by us and numerous other analysts has finally arrived – Last week, Facebook surpassed Google.com to become the most visited website in the United States. Facebook has enjoyed an enormous growth since the day it was created, having it’s fastest growth ever during the last three months of this year. When compared to the same time in 2009 (which in itself saw a huge spike in visits compared to 2008), there has been an enormous, 185 percent increase in visits. 2010 Has definitely started well for Facebook. In comparison, Google has increased it’s visitor count aswell, but it has topped at only nine percent in the same time. So where are we headed? It is clear that people have a profound need to comunicate. Today, Facebook enables them to do it better than any other networking site on the internet. And with an active user base growing near to half a billion, it is quite possible to find even your farthest relatives there. Today, nothing seems to stop Facebook from growing and it will quite probably keep it’s newly acquired position as the number one site in the US. With over 200 million people logging in to Facebook daily, it is definitely the place for your company to be seen. Our prediction that Facebook will reach 700 million this year seems more and more probable. Newspaper ads are history – the time to start communicating is now. I wonder when Facebook will reach 500 million users. If we look at the latest growth rate – about 19 million per month – then June or July and at least 600 million by the end of the year. It depends if the growth will slow down or not. Wow, I jsut cant believe they kicked Google to the curb.